Location is great; as it is a beach club, right on the beach but still easy accessible. Atmosphere really amazing! Ask for a table near the window. Nice but a bit chaotic service. Food was good and tasty but not great. Enough choices. We had a great business lunch here. Food came quick and tasted fresh. 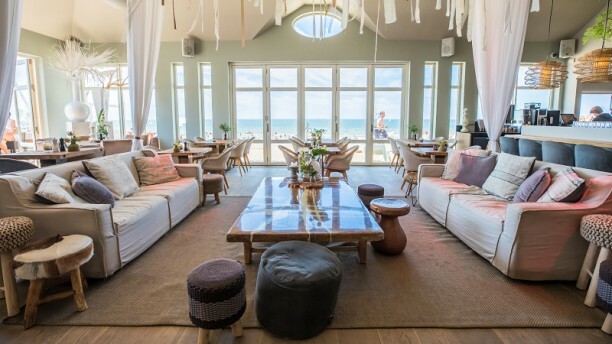 It’s location on the beach of Noordwijk is perfect with views over the sea! Service is attentive! Prices are what one could expect from this location. We would definitely come back here. Besser geht’s nicht: Blick auf die Nordsee, großartige Küche und extrem freundliches Personal. Mit Kindern hinzugehen, ist kein Problem. Für mich ist der Beach Club einer der schönsten Orte überhaupt am Meer. Jedes Mal schön! The dishes are very good but the description in the english menu is not quite accurate. For example : the linguinni with shrimps. I had to switch my dish with my husband because the linguinni were "specials" one (black) and I didn't like them at all. It wasn't describe in the menu.